EDWARDS AFB – The Air Force Flight Test Museum at Edwards AFB, brought three aircraft, a T-38A, a single-seat F-16XL and an X-4 Bantam, out of storage last week. 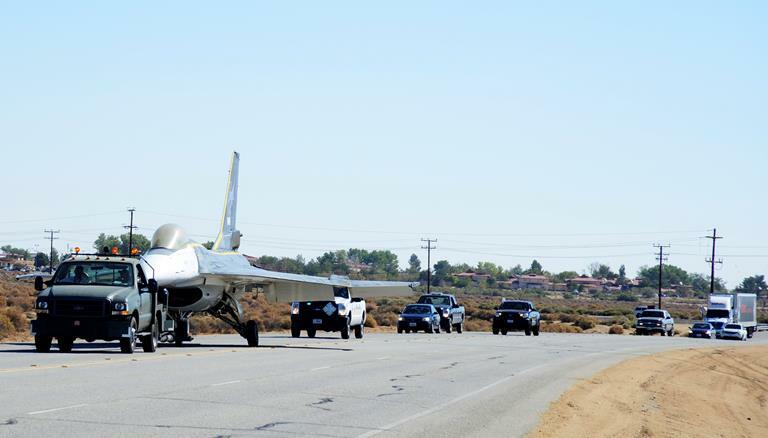 Traffic was stopped as the aircraft made their way down Rosamond Blvd. to the museum. It was a rare treat for the bi-weekly General Public Tour given by the 412th Test Wing Public Affairs Office, which had tourists visiting the museum at the time. Prior to the move, the aircraft were stored at Hangar 1864, the museum’s restoration hangar. According to George Welsh, AFFT Museum curator, “The T-38 was in great shape.” He added that the aircraft had been adopted by a local Eagle Scout group which volunteers to maintain its appearance. He added that the F-16XL, an experimental fighter, is a derivative of the F-16 that was used to explore the advanced cranked-arrow delta wing. Of the two that were built, the museum has the number one bird. After more than a decade of outdoor storage, the X-4 underwent a complete external restoration by a group of volunteers. “The X-4, purely an experimental aircraft, is a late 1940 design that explored the flight characteristics of tailless aircraft in the transonic speed range. This aircraft is unique in that only one pilot, Charles Tucker, flew it during its entire career,” said Simone. The X-4 now sits in the museum repainted in its original color scheme of red and light grey stripes. Northrop Grumman originally added the red stripes to improve visibility to the very small aircraft. The three aircraft that were moved “represent nearly 70 years of aviation excellence,” said Simone. Senior Airman Lucas Underwood, 412th Aircraft Maintenance Squadron, has been volunteering at the museum working on airframes since he moved to Edwards in 2011. He was on a base tour for first-term Airmen when the tour guide suggested volunteering at the museum. Underwood recalled first seeing the museum’s X-4, which now sits inside the museum, as being “pieces on trailers.” He explained that it had been outside for years and was in desperate need of restoration. “I actually got to see the thing being built from the ground up,” said Underwood. Welsh said that moving the aircraft has freed up space in the restoration hangar allowing them to make plans to move additional aircraft from South Base that need restoration. “That’s why we’re here, to preserve [the aircraft] and use them to educate people as to what the aircraft did here at Edwards and what the significance was,” said Welsh. He concluded that adding more aircraft to the museum’s outdoor static display will allow people to see base history even after museum hours. The aircraft will be supplemented with outdoor graphics that tell their stories. Welsh mentioned the aircraft on display also act as a staging area for the new museum that is set to be constructed outside the West Gate on Rosamond Blvd. “[Moving the aircraft] consolidates our collection. We do have an amazing collection of aircraft and now, with the help of security forces, base civil engineering and airfield management, we can show it to the public,” Welsh said.